In this tutorial, you will learn how to use Keras for multi-input and mixed data. You will learn how to define a Keras architecture capable of accepting multiple inputs, including numerical, categorical, and image data. We’ll then train a single end-to-end network on this mixed data. In this series of posts, we’ve explored regression prediction in the context of house price prediction. 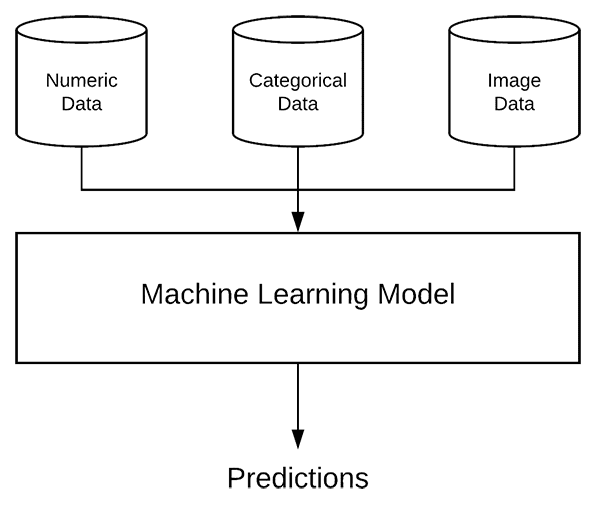 The house price dataset we are using includes not only numerical and categorical data, but image data as well — we call multiple types of data mixed data as our model needs to be capable of accepting our multiple inputs (that are not of the same type) and computing a prediction on these inputs. Define a Keras model capable of accepting multiple inputs, including numerical, categorical, and image data, all at the same time. Train an end-to-end Keras model on the mixed data inputs. Evaluate our model using the multi-inputs. To learn more about multiple inputs and mixed data with Keras, just keep reading! In the first part of this tutorial, we will briefly review the concept of both mixed data and how Keras can accept multiple inputs. From there we’ll review our house prices dataset and the directory structure for this project. Load the numerical, categorical, and image data from disk. Pre-process the data so we can train a network on it. Prepare the mixed data so it can be applied to a multi-input Keras network. Once our data has been prepared you’ll learn how to define and train a multi-input Keras model that accepts multiple types of input data in a single end-to-end network. Finally, we’ll evaluate our multi-input and mixed data model on our testing set and compare the results to our previous posts in this series. 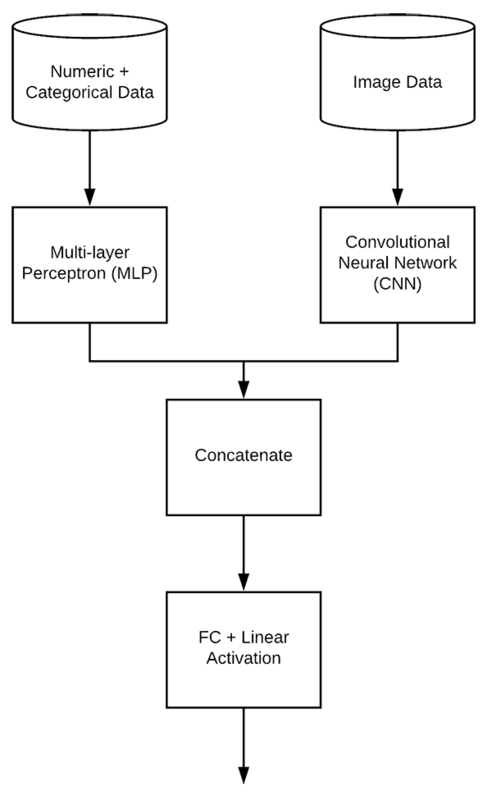 Figure 1: With the Keras’ flexible deep learning framework, it is possible define a multi-input model that includes both CNN and MLP branches to handle mixed data. 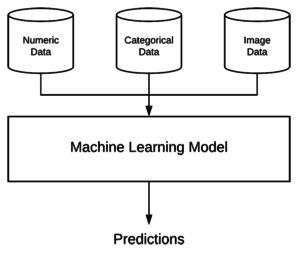 In machine learning, mixed data refers to the concept of having multiple types of independent data. For example, let’s suppose we are machine learning engineers working at a hospital to develop a system capable of classifying the health of a patient. Image data, such as any MRI, X-ray, etc. All of these values constitute different data types; however, our machine learning model must be able to ingest this “mixed data” and make (accurate) predictions on it. You will see the term “mixed data” in machine learning literature when working with multiple data modalities. Developing machine learning systems capable of handling mixed data can be extremely challenging as each data type may require separate preprocessing steps, including scaling, normalization, and feature engineering. Working with mixed data is still very much an open area of research and is often heavily dependent on the specific task/end goal. We’ll be working with mixed data in today’s tutorial to help you get a feel for some of the challenges associated with it. 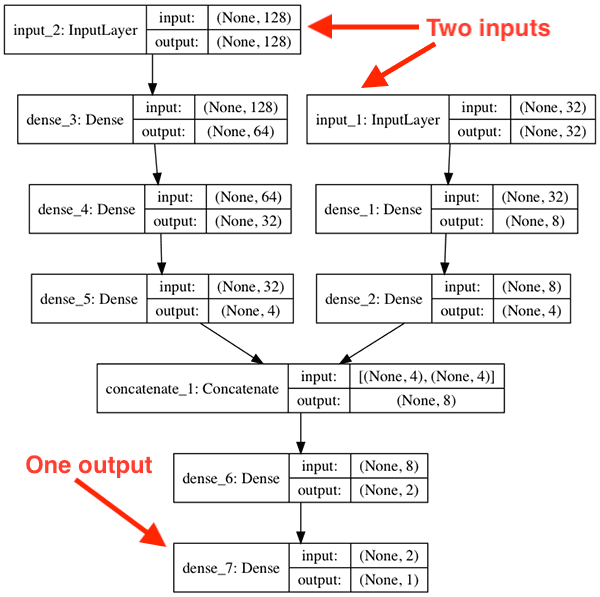 How can Keras accept multiple inputs? Figure 2: As opposed to its Sequential API, Keras’ functional API allows for much more complex models. In this blog post we use the functional API to support our goal of creating a model with multiple inputs and mixed data for house price prediction. Keras is able to handle multiple inputs (and even multiple outputs) via its functional API. This network is a simple feedforward neural without with 10 inputs, a first hidden layer with 8 nodes, a second hidden layer with 4 nodes, and a final output layer used for regression. Notice how we are no longer relying on the Sequential class. Lines 21-23 define a simple 32-8-4 network using Keras’ functional API. Similarly, Lines 26-29 define a 128-64-32-4 network. We then combine the outputs of both the x and y on Line 32. The outputs of x and y are both 4-dim so once we concatenate them we have a 8-dim vector. We then apply two more fully-connected layers on Lines 36 and 37. The first layer has 2 nodes followed by a ReLU activation while the second layer has only a single node with a linear activation (i.e., our regression prediction). Defines the outputs as the final set of FC layers (i.e., z ). Figure 3: This model has two input branches that ultimately merge and produce one output. The Keras functional API allows for this type of architecture and others you can dream up. Notice how our model has two distinct branches. The first branch accepts our 128-d input while the second branch accepts the 32-d input. These branches operate independently of each other until they are concatenated. From there a single value is output from the network. In the remainder of this tutorial, you will learn how to create multiple input networks using Keras. Figure 4: The House Prices dataset consists of both numerical/categorical data and image data. Using Keras, we’ll build a model supporting the multiple inputs and mixed data types. The result will be a Keras regression model which predicts the price/value of houses. In this series of posts, we have been using the House Prices dataset from Ahmed and Moustafa’s 2016 paper, House price estimation from visual and textual features. This dataset includes both numerical/categorical data along with images data for each of the 535 example houses in the dataset. In the first post in this series, you learned how to train a Keras regression network on the numerical and categorical data. Then, last week, you learned how to perform regression with a Keras CNN. Today we are going to work with multiple inputs and mixed data with Keras. We are going to accept both the numerical/categorical data along with our image data to the network. Two branches of a network will be defined to handle each type of data. The branches will then be combined at the end to obtain our final house price prediction. In this manner, we will be able to leverage Keras to handle both multiple inputs and mixed data. The House Prices dataset should now be in the keras-multi-input directory which is the directory we are using for this project. The Houses-dataset folder contains our House Prices dataset that we’re working with for this series. When we’re ready to run the mixed_training.py script, you’ll just need to provide a path as a command line argument to the dataset (I’ll show you exactly how this is done in the results section). pyimagesearch/datasets.py : Handles loading and preprocessing our numerical/categorical data as well as our image data. We previously reviewed this script over the past two weeks, but I’ll be walking you through it again today. pyimagesearch/models.py : Contains our Multi-layer Perceptron (MLP) and Convolutional Neural Network (CNN). These components are the input branches to our multi-input, mixed data model. We reviewed this script last week and we’ll briefly review it today as well. 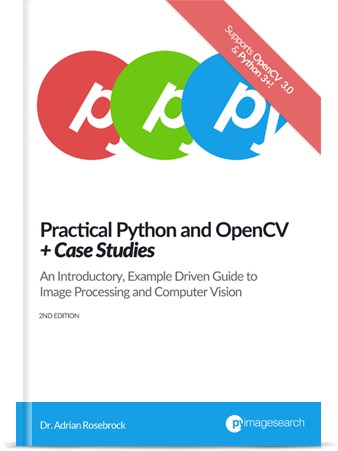 mixed_training.py : Our training script will use the pyimagesearch module convenience functions to load + split the data and concatenate the two branches to our network + add the head. It will then train and evaluate the model. Figure 5: We use pandas, a Python package, to read CSV housing data. We covered how to load the numerical and categorical data for the house prices dataset in our Keras regression post but as a matter of completeness, we will review the code (in less detail) here today. Be sure to refer to the previous post if you want a detailed walkthrough of the code. Our imports are handled on Lines 2-8. From there we define the load_house_attributes function on Lines 10-33. This function reads the numerical/categorical data from the House Prices dataset in the form of a CSV file via Pandas’ pd.read_csv on Lines 13 and 14. The data is filtered to accommodate an imbalance. Some zipcodes only are represented by 1 or 2 houses, therefore we just go ahead and drop (Lines 23-30) any records where there are fewer than 25 houses from the zipcode. The result is a more accurate model later on. This function applies min-max scaling to the continuous features via scikit-learn’s MinMaxScaler (Lines 41-43). Then, one-hot encoding for the categorical features is computed, this time via scikit-learn’s LabelBinarizer (Lines 47-49). The continuous and categorical features are then concatenated and returned (Lines 53-57). 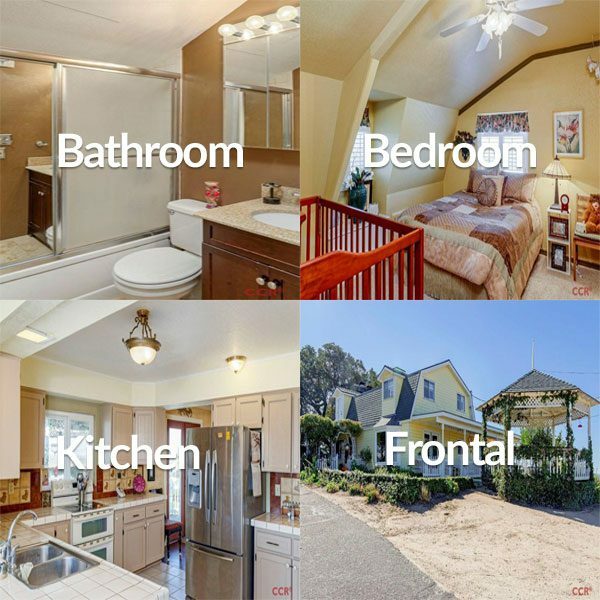 Figure 6: One branch of our model accepts a single image — a montage of four images from the home. Using the montage combined with the numerical/categorial data input to another branch, our model then uses regression to predict the value of the home with the Keras framework. Load all photos from the House Prices dataset. Recall that we have four photos per house (Figure 6). Generate a single montage image from the four photos. The montage will always be arranged as you see in the figure. Append all of these home montages to a list/array and return to the calling function. Beginning on Line 59, we define the function which accepts a Pandas dataframe and dataset inputPath . Initialize the images list (Line 61). We’ll be populating this list with all of the montage images that we build. Grab the paths to the four photos for the current house (Lines 67 and 68). Perform initializations (Lines 72 and 73). Our inputImages will be in list form containing four photos of each record. Our outputImage will be the montage of the photos (like Figure 6). Load, resize, and append each photo to inputImages (Lines 79-81). The bathroom image in the top-left. The bedroom image in the top-right. The frontal view in the bottom-right. The kitchen in the bottom-left. Append the tiling/montage outputImage to images (Line 94). Jumping out of the loop, we return all the images in the form of a NumPy array (Line 97). We’ll have as many images as there are records we’re training with (remember, we dropped a few of them in the process_house_attributes function). Each of our tiled images will look like Figure 6 (without the overlaid text of course). You can see the four photos therein have been arranged in a montage (I’ve used larger image dimensions so we can better visualize what the code is doing). Just as our numerical and categorical attributes represent the house, these four photos (tiled into a single image) will represent the visual aesthetics of the house. If you need to review this process in further detail, be sure to refer to last week’s post. Figure 7: Our Keras multi-input + mixed data model has one branch that accepts the numerical/categorical data (left) and another branch that accepts image data in the form a 4-photo montage (right). As you’ve gathered thus far, we’ve had to massage our data carefully using multiple libraries: Pandas, scikit-learn, OpenCV, and NumPy. The skills we’ve used in order to accomplish this have been developed through experience + practice, machine learning best practices, and behind the scenes of this blog post, a little bit of debugging. Please don’t overlook what we’ve discussed so far using our data massaging skills as it is key to the rest of our project’s success. Let’s shift gears and discuss our multi-input and mixed data network that we’ll build with Keras’ functional API. The first branch will be a simple Multi-layer Perceptron (MLP) designed to handle the categorical/numerical inputs. The second branch will be a Convolutional Neural Network to operate over the image data. These branches will then be concatenated together to form the final multi-input Keras model. We’ll handle building the final concatenated multi-input model in the next section — our current task is to define the two branches. Lines 2-11 handle our Keras imports. You’ll see each of the imported functions/classes going forward in this script. 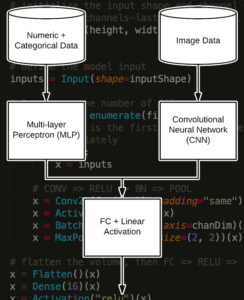 Our categorical/numerical data will be processed by a simple Multi-layer Perceptron (MLP). The MLP is defined by create_mlp on Lines 13-24. A fully connected ( Dense ) input layer with ReLU activation (Line 16). A fully-connected hidden layer, also with ReLU activation (Line 17). And finally, an optional regression output with linear activation (Lines 20 and 21). While we used the regression output of the MLP in the first post, it will not be used in this multi-input, mixed data network. As you’ll soon see, we’ll be setting regress=False explicitly even though it is the default as well. Regression will actually be performed later on the head of the entire multi-input, mixed data network (the bottom of Figure 7). The MLP branch is returned on Line 24. Referring back to Figure 7, we’ve now built the top-left branch of our network. depth : The number of channels in our input images. For RGB color images, it is three. The Input to the model is defined via the inputShape on (Line 33). From there we begin looping over the filters and create a set of CONV => RELU > BN => POOL layers. Each iteration of the loop appends these layers. 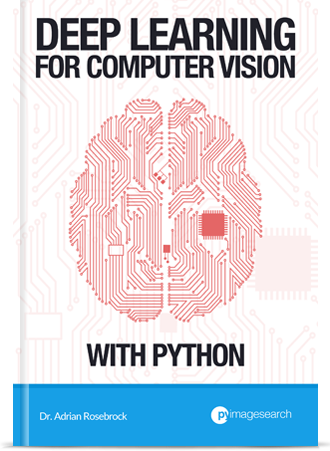 Be sure to check out Chapter 11 from the Starter Bundle of Deep Learning for Computer Vision with Python for more information on these layer types if you are unfamiliar. Another fully-connected layer is applied to match the four nodes coming out of the multi-layer perceptron (Lines 57 and 58). Matching the number of nodes is not a requirement but it does help balance the branches. On Lines 61 and 62, a check is made to see if the regression node should be appended; it is then added in accordingly. Again, we will not be conducting regression at the end of this branch either. Regression will be performed on the head of the multi-input, mixed data network (the very bottom of Figure 7). We can then return the CNN branch to the calling function (Line 68). Now that we’ve defined both branches of the multi-input Keras model, let’s learn how we can combine them! We are now ready to build our final Keras model capable of handling both multiple inputs and mixed data. This is where the branches come together and ultimately where the “magic” happens. Training will also happen in this script. Our imports and command line arguments are handled first. datasets : Our three convenience functions for loading/processing the CSV data and loading/pre-processing the house photos from the Houses Dataset. 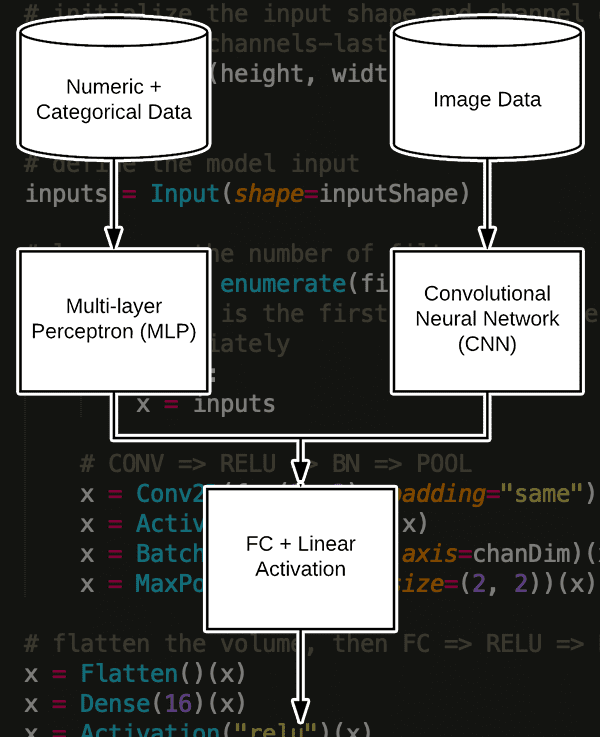 models : Our MLP and CNN input branches which will serve as our multi-input, mixed data. train_test_split : A scikit-learn function to construct our training/testing data splits. concatenate : A special Keras function which will accept multiple inputs. argparse : Handles parsing command line arguments. We have one command line argument to parse on Lines 15-18, --dataset , which is the path to where you downloaded the House Prices dataset. Here we’ve loaded the House Prices dataset as a Pandas dataframe (Lines 23 and 24). Then we’ve loaded our images and scaled them to the range [0, 1] (Lines 29-30). Be sure to review the load_house_attributes and load_house_images functions above if you need a reminder on what these functions are doing under the hood. Our training and testing splits are constructed on Lines 35 and 36. We’ve allocated 75% of our data for training and 25% of our data for testing. From there, we find the maxPrice from the training set (Line 41) and scale the training and testing data accordingly (Lines 42 and 43). Having the pricing data in the range [0, 1] leads to better training and convergence. Finally, we go ahead and process our house attributes by performing min-max scaling on continuous features and one-hot encoding on categorical features. The process_house_attributes function handles these actions and concatenates the continuous and categorical features together, returning the results (Lines 48 and 49). Handling multiple inputs with Keras is quite easy when you’ve organized your code and models. On Lines 52 and 53, we create our mlp and cnn models. Notice that regress=False — our regression head comes later on Line 62. We’ll then concatenate the mlp.output and cnn.output as shown on Line 57. I’m calling this our combinedInput because it is the input to the rest of the network (from Figure 3 this is concatenate_1 where the two branches come together). The combinedInput to the final layers in the network is based on the output of both the MLP and CNN branches’ 8-4-1 FC layers (since each of the 2 branches outputs a 4-dim FC layer and then we concatenate them to create an 8-dim vector). We tack on a fully connected layer with four neurons to the combinedInput (Line 61). Then we add our "linear" activation regression head (Line 62), the output of which is the predicted price. Our Model is defined using the inputs of both branches as our multi-input and the final set of layers x as the output (Line 67). Our model is compiled with "mean_absolute_percentage_error" loss and an Adam optimizer with learning rate decay (Lines 72 and 73). Training is kicked off on Lines 77-80. This is known as fitting the model (and is also where all the weights are tuned by the process known as backpropagation). To evaluate our model, we have computed absolute percentage difference (Lines 89-91) and used it to derive our final metrics (Lines 95 and 96). These metrics (price mean, price standard deviation, and mean + standard deviation of the absolute percentage difference) are printed to the terminal with proper currency locale formatting (Lines 100-103). Figure 8: Real estate price prediction is a difficult task, but our Keras multi-input + mixed input regression model yields relatively good results on our limited House Prices dataset. Finally, we are ready to train our multi-input network on our mixed data! Configured your dev environment according to the first tutorial in this series. Downloaded the house prices dataset using the instructions in the “Obtaining the House Prices dataset” section above. Our mean absolute percentage error starts off very high but continues to fall throughout the training process. By the end of training, we are obtaining of 22.41% mean absolute percentage error on our testing set, implying that, on average, our network will be ~22% off in its house price predictions. …has led to a better performing model! In this tutorial, you learned how to define a Keras network capable of accepting multiple inputs. You learned how to work with mixed data using Keras as well. The numerical data was min-max scaled to the range [0, 1] prior to training. Our categorical data was one-hot encoded (also ensuring the resulting integer vectors were in the range [0, 1]). The numerical and categorical data were then concatenated into a single feature vector to form the first input to the Keras network. Our image data was also scaled to the range [0, 1] — this data served as the second input to the Keras network. One branch of the model included strictly fully-connected layers (for the concatenated numerical and categorical data) while the second branch of the multi-input model was essentially a small Convolutional Neural Network. The outputs of both branches were combined and a single output (the regression prediction) was defined. In this manner, we were able to train our multiple input network end-to-end, resulting in better accuracy than using just one of the inputs alone. I hope you enjoyed today’s blog post — if you ever need to work with multiple inputs and mixed data in your own projects definitely consider using the code covered in this tutorial as a template. From there you can modify the code to your own needs. To download the source code, and be notified when future tutorials are published here on PyImageSearch, just enter your email address in the form below! This is a great example of fusion, thank you Adrian! Do you have an idea of how you would use pre-trained weights, with the features already mapped, of something trained on VOC or Imagenet in the CNN branch? Where would something like that fit in the process? Do you already know how to perform fine-tuning? If not, make sure you read up on the topic. 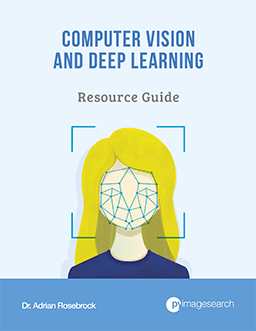 Deep Learning for Computer Vision with Python covers fine-tuning and transfer learning in detail. For a project such as this one you would remove perform the standard fine-tuning process for a CNN but this time have a separate branch for your categorical and numeric value inputs. From there you can train your network. For your case, you would need to write custom function to load pre-trained weight first. And, you can use resulted matrix in input layer. You are really inspiration for me to always learn new concepts in machine learning. Let me know if you have any plans for Speech Recognition/Voice related projects? Thanks Arslan 🙂 I primarily cover computer vision here so I don’t currently have any plans for speech recognition tutorials but I do think it’s an interesting topic. Thanks for the suggestion but to be honest it’s probably a bit unlikely for me to cover here. Thanks Adrian for the great tutorial as always! Being a newbie in deep learning I have been following your post rapidly these days with resourceful information. I am not sure if I can ask this question here; my apology in advance if not. I studied Francis´s keras book mentioning about the usages of Sequential and functional APIs; also seen in your posts and here as well. But I have noticed some examples like this https://towardsdatascience.com/how-to-train-your-model-dramatically-faster-9ad063f0f718 have used Sequential model also for the model architecture from Inception too. Is it possible to use Sequential model instead for functional API for Inception, ResNet or Xception too like this medium post? Any Sequential API network can be implemented with a Functional API. The reverse is not true. Thank you for the response. So, we can not use Sequential Model for inception, resnet or other deeper CNN then, is it? Any model that is non-sequential, such as Inception or ResNet, cannot be implemented using the Sequential class. You would need the Functional API instead. Hey Adrian, you got some wonderful stuff here. I follow each and every article you post and certainly I love each of them. Also its due to you I’ve gained so much interest in computer vision and machine learning. Thanks for being a reader Yash, I’m glad you’re enjoying the tutorials! 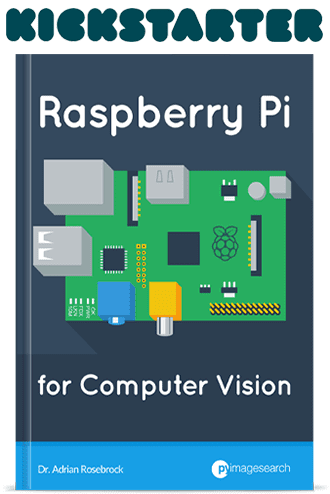 This will guarantee the scaled trainY and testY values are within the range [0, 1]. maxPrice = trainAttrX[“price”].max() will work most of time but it is possible the real maxPrice is in testAttrX[“price”], not in trainAttrX[“price”]. The outcome may not be significant but I feel maxPrice = df[“price”].max() is more logical. Technically you are right, that would absolutely guarantee the target values are in the range [0, 1]. However, that is incorrect in the context of running a deep learning experiment. We are not allowed to use our test set to determine any information on the training process. We can only use the training set to determine any values required for normalization, scaling, preprocessing, etc. Also, for future predictions of unknown “samples”, you might encounter samples with even higher price. So it will be impossible to ensure that future samples stay within the [0, 1] range (unless you set a very high “maxPrice” – but then you no longer span training data from [0, 1] which is sub-optimal). Hi Adrian, I have been happily following this project (and all the cool stuff you post). I just have a small question… why do you think I obtain different mean and standard deviation results without changing anything at all on the code? Thanks! The weights in the neural network are randomly initialized. Neural networks are stochastic algorithms. You will get slightly different results each time and since we’re using a very small dataset a poor initialization of weights may lead to worse results. Thanks Juan for asking a question I was asking myself and Adrian for answering. I hesitated between poor random initialisation (is there a way to make a fixed random seed with Keras: for debugging purposes, it would be more comfortable being able to reproduce a bug) or overflow/numerical accidents: as I use a RPi , I was unsure of the quality of Keras (and I noticed that it used 3 processors, with learning times 10 times slower than on Adrian PC…) and it gives very few time to try to fix / adapt things. Thanks so much Stalin, I’m glad you’re enjoying the tutorials! Thank you for your explanation! This article helps me a lot! However, I’m still confused about implementing multiple inputs and multiple outputs case. In this article, different inputs have the same size, how does Keras deal with inputs with different size and multiple outputs? Especially when I’d like to iteratively sample a mini-batch from dataset A and then sample a mini-batch from dataset B. Thanks! There is an entire body of literature that governs “missing values” in machine learning. You should spend some time researching it and looking into it. I have a question though, why did you choose #bedRs and #BathRs to be continuous features not categorical. I thought continuous feature means it can accepts real values like the area, but a house can’t have 2.5 bathrooms :D.
Actually a house can have 2.5 bathrooms. The “.5” is normally referred to as a “half bath”, such as a toilet + sink but no shower/bath. Another question. What if the number of images per entry is not consistent?. 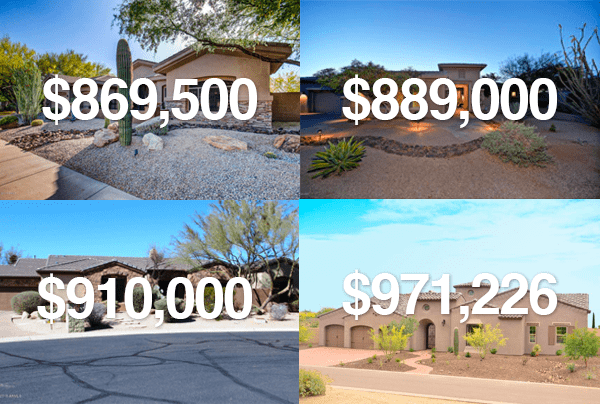 For example, the number of images per house entry ranges from 0 to 10. See the other comments on this post where I address the same question. You are correct, am embedding can be used here as well. 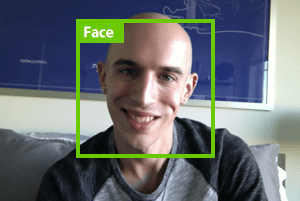 Did you get a chance to try this with individual images that are larger than 32×32? To me this feels like it cannot capture much information about the house. You can modify the architecture and try experiments with larger images if you would like. The problem is that if you increase the spatial dimensions of the images you will need to deepen your network as well. That raises a big problem as our dataset itself is so small. Realistically we would need a larger dataset to obtain higher accuracy. Thanks for your tutorial. please suggest on how can i get through “from pyimagesearch import models” as i could find the respective packages. Many thanks ..
You need to use the “Downloads” section of the post to download the “pyimagesearch” module. Thank you so much for your work! Inspired by the tutorial, I have been doing some NLP project. I wish you could give me some advice if I can ask. There are two types of inputs; text and numerical. The texts are converted into TfIdf vectors in 1000 length and the numerical feature is simply one column added onto each vector. Now, concatenating them creates a new set of features of 1001 size. Each row should be sparse since 1000 of them are TfIdf vector values. My question is whether or not the only numerical feature may be overpowered by the TfIdf vector values. If so, how can I put more weight on the numerical feature? I don’t do much work in NLP. You should reach out to Jason over at Machine Learning Mastery. He knows a bit more about NLP than I do and would likely be able to give you a more detailed answer. Excellent tutorial (the series)! Previously I have been searching “high and low” for good introductions to CNN-regression, without really finding any. 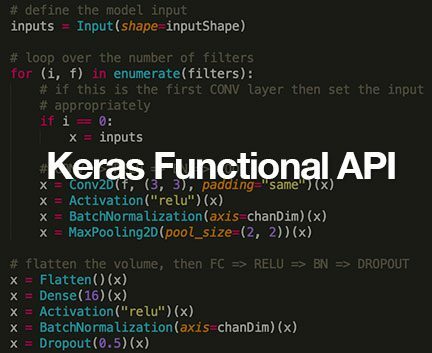 And the introduction to the Keras functional API and example of mixed input is equally great. 1) With a mixed input setup, is it possible to use augmentation on the CNN branch (I know it doesn’t make sense with the Houses example), or will that break the “alignment” of the two branches? 2) Again, in relation to the mixed input, I am trying to get my head straight on the following: does the merging of the MPL impact the learning in CNN branch? What I mean is: assuming IDENTICAL initialization of the weights in the “pure CNN” regression example and “mixed input CNN” regression example will the weights end up differently due to the concatenated MPL? Or does the CNN branch act as an “independent feature extractor”? Thanks Henrik, I’m glad you enjoyed the guide! 1. You can certainly apply data augmentation to the CNN branch. I would encourage it, actually. You can either augment each image individually or simply augment the entire montage. I would test both. 2. The two branches are independent until they merge. They don’t share any intermediary layers until they are concatenated. Many thanks for your excellent and detailed tutorial, which exactly solves the puzzles I am now coming across. I hope to be allowed for a further question. What if I use the ImageDataGenerator to preprocess trainImagesX, how do I get to combine the preprocessed trainImagesX and another categorical or numeric attribute trainAttrX using model.fit_generator? I would suggest reading this tutorial to learn how to create your own custom data generator for Keras. Excellent tutorial Adrian. Please keep this up.